Since I haven’t been writing much about outstation travels around Perak, allow me to get back into the groove, and share a simple post about this restaurant (or rather, coffee shop?) 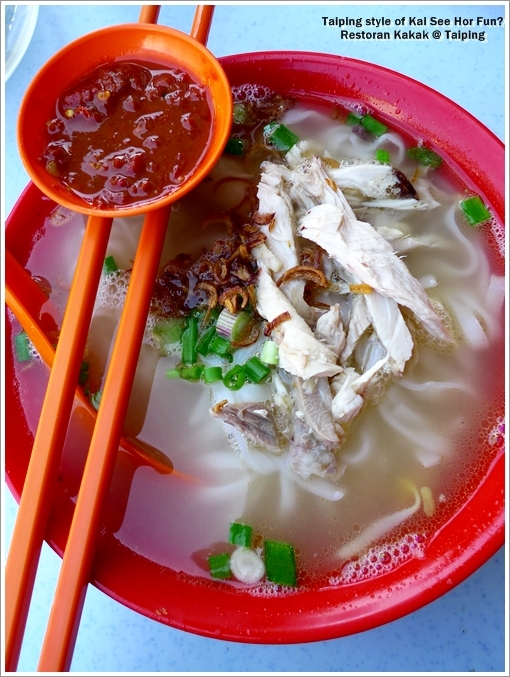 that serves Taiping’s version of chicken noodle soup for breakfast. The name of the shop? Restoran Kakak. One glance and you’d be forgiven for thinking this is another bowl of “Kai See Hor Fun” from Ipoh, or even a toned down version of Penang’s Koay Teow Th’ng. A little misleading, for a traditional Chinese coffee shop to be named as such? They were caught up in the bustling atmosphere, in an almost clockwork-like trance. The breakfast crowd was impressive, even on a weekday’s morning. But of course, I did not stumble upon this quaint little coffee shop, tucked in the middle of a row of colonial shophouses on Jalan Pasar (Market Street) in Taiping town. A friend from Taiping actually introduced me to this shop, stating that this is his family’s favourite as well. The piping hot bowl of smooth koay teow arrived with pieces of shredded chicken meat, crunchy bean sprouts, and garnished with chopped scallions and fried shallots. 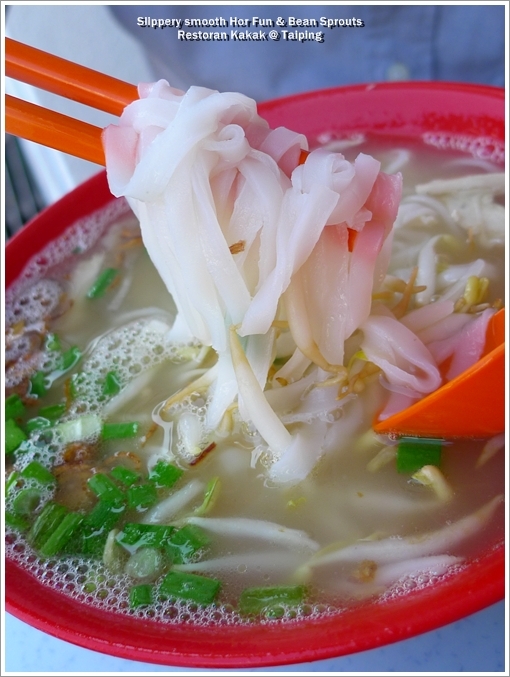 The thin, almost translucent slivers of flat rice noodles was impressive, but personally not on the same level as Ipoh’s variety. Don’t get me wrong here, the koay teow was good in its own right; being smooth and slithered down my throat with ease, but the noodles were generally thicker. Taiping has at least one noodles and koay teow factory (I know, for sure as I’ve visited the factory previously), hence the question of the source of supply was never raised. 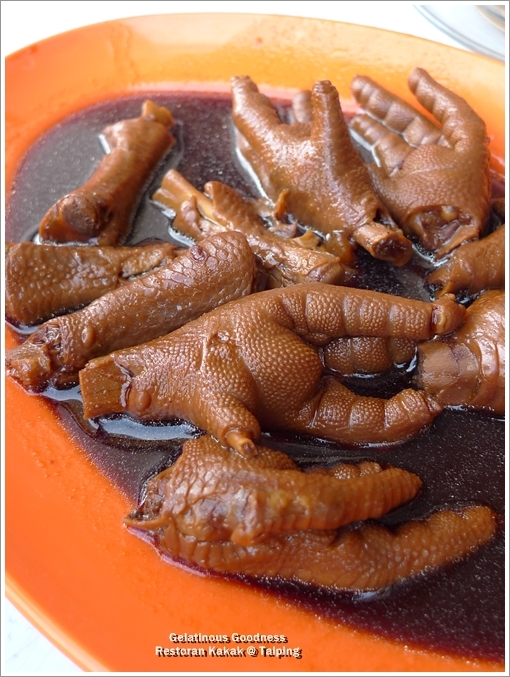 Braised Chicken Feet in Soy Sauce was a tasty accompaniment, requiring no dipping sauce nor extra kick from the chopped chillies. The soup was sweet, almost passing off as MSG-laden broth, but thankfully the thirsty after-effect was minimal. But the steel mugs of possibly-homemade spicy sambal sauce on every table was evidently not something you’d want to miss. Perfect as accompaniment to the “Liew” (stuffed fish paste, or better known as Yong Tau Foo), or the shredded chicken in your bowl of noodles. Not an unfamiliar sight in the mornings, the shop can get REALLY packed, and we were even seated on the walkway in front of the shop. The time is nigh. I should be going on various excursions from now on. After the two initial honeymoon months of inactivity, let’s see how fruitful this year’s food-hunting can be. Here’s a GOOGLE MAP to Restoran Kakak, for future reference. And if you’re not familiar with Taiping’s roads, hop over to my previous post on Yut Sun Hainanese Restaurant for the directions at the end of the post. Yut Sun is also situated on the same road as Restoran Kakak. You can also read Places and Foods or Makantrip.com (they highly recommended the Kakak Ping, a combination of Nescafe + Barley!) for their takes on Restoran Kakak. Yeah, every home I think. Love those kind of soups! Most KT thng in KL a bit oily. Will go there again later this year. 🙂 Thanks for the link. You’re most welcomed. Thanks for the information as well. i heard kakak have open new outlet at taipan subang jaya. is it true? Hi janice, I have not heard about this. If yes, then this will be great. Because rarely can you find soupy kuey teow here in KL/PJ, let alone one version that’s like Kakak’s. Nice post, sure will find a chance to try it out when visit there next round. Thanks Thomas. 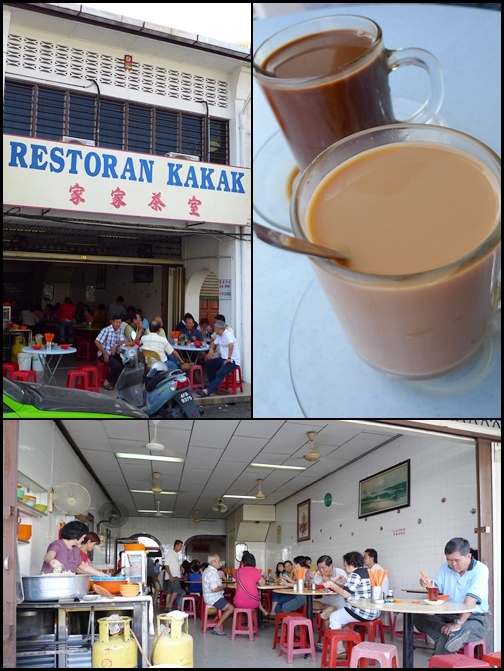 This Kakak is a very popular spot for breakfast amongst the locals there, it seemed. 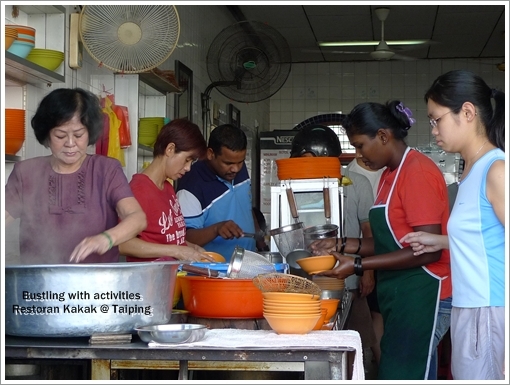 In Penang, they’re usually known as kuey teow thng, or kuey teow soup. But with fish balls, fish cakes, etc. I grew up in Taiping,and now stay in Singapore, i used to called it “koay teow th’ng” in Taiping or even in Singapore, but in Johor Bahru, they called it ” koay teow kia”, a more Teochew way of addresing for this food. In Singapore and JB, they resemble each other by having fish balls and minced pork but no chicken meat. Oh, and I thought only in Penang do they call this Koay Teow Th’ng? Yeah, I usually address the soup noodles as such, or just plain Ching Thong Hor Fun. Yes, in Penang i used to called Koay Teow Th’ng, but i could not remember whether Ching Th’ng Hor Fun was been used there during my A level years in the 70s. The Penang Hor Fun was very nice, sticky egg gravy with the koay teow, to my memory it was superior to the Singapore’s Sar Ho Fun. Thank you again for the blog, all the photos are great~!! You are awesome~! Hi Calven, thanks for the comment. Yeah I only knew about the Kakak-ping after I came back from taiping the other day, and did a search around. I tried to have the Do Re Mi drink from the Larut Matang Stall, but then again, they served me the usual Nescafe pulak. Great review on restoran kakak. in fact, if you ask a “Taiping-lang” the way to eat the noodles is to pour some of the sambal into the noodles and take it all down. Totally in agreement with Calven another hidden stuff in this outlet is their “Ka ka peng”. You have to try it…. . so remember to try the “ka ka peng”! 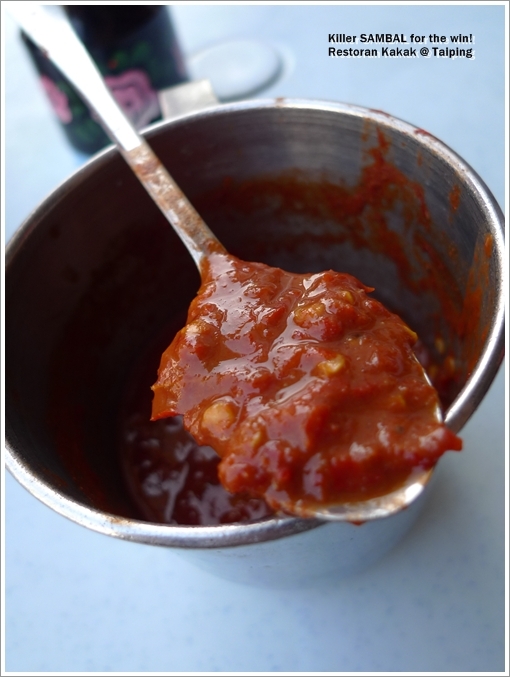 Oh some sambal for the noodles? To kick things up a notch eh? But I like my soup to be clearer and like the usual ‘ch’ng tong’ though. I will try to go Taiping again, but I highly doubt I can find the time once I am in KL. Hey there, Thank you for all the great reviews on Ipoh food. your blog is like a beacon of hope for me, that i no longer find spending most of my weekends here in Ipoh to be… dull and uninteresting. Right, back to your review on kakak hor fun ch’ng tong. Personally, i find her soup based noodles are just BAD. I myself a Taiping boy, so i got to say it is the sambal or the chili flakes + chicken stock have let her and many out there stay in the biz for many years. Because majority of folks there would be happily chow down just about anything with sauce, especially the spicy type. The better bet for noodle soup is at this shop selling Hakka YTF, with its soy beans based clear soup, good enough to eat without any condiments and sauce.